We say hello to the fourth month of the year, and yet it only seems recently that we were celebrating Christmas and all the festivities associated with the season. The seasons come and go so quickly that I am nowadays reminded of how my Grandmother would say "How the time flies, and how much faster it goes the older one gets" I never quite grasped what she meant then, but as my years accumulate, I fully understand, and indeed the time does fly, as I am sure you will agree. So, here we are with hopefully warmer days to look forward to. More time will be spent outside soaking up the sun and the gardeners amongst you will be either enjoying the extra chores or moaning the fact that the lawn yet again needs another cut! If any of you have a young puppy, house training becomes just that little bit easier, because the garden door is left open and the young charge can come and go more easily, and mistakes are a little less. With all this and the lengthening days summer is indeed a grand time for everyone and especially our Cavaliers, who like nothing better than sunning themselves, and when they get a little too hot seek out the shade of a tree or shrub. Puppies are so amusing too, they seem to invent all sorts of new games whilst outside. We have at present a nine month puppy who has great fun stalking unseen things, creeping on her tummy then suddenly jumping up, turning tail and running as fast as her legs will carry her, ears flapping tail between her legs terrified of the unseen monster giving chase, and into the safety of indoors, turning around running out again, creeping in the grass finding another monster and repeating the process. 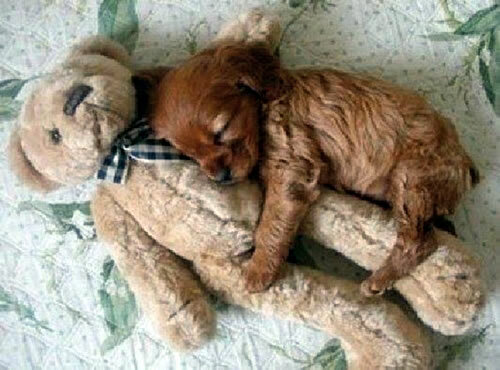 I often think puppies are a little like human beings as children. Did you ever frighten yourself turning off the light and jumping into bed in the darkness, just in time before the crocodile hiding under the bed can catch you? Gardens are fantastic playgrounds, but for puppies can also be a hazardous place. Puppies will chew and eat anything, and many of the plants grown in pots and around the average garden are quite toxic, so an inventory should be made and perhaps ways should be found to either move these plants out of reach or better still dug up and replaced with something more dog friendly. If you use a garden mulch, do not use cocoa shell. It looks and smells fantastic but unfortunately is very toxic to dogs. There have been cases where dogs have ingested this with fatal consequences. Much safer to use pine bark mulch. Puppies love to play with snails, don’t ever let them do this. Snails carry a parasite which in turn leads to heart and lung worm which sadly seems to be heard of more and more these days. If you do use lawn feed and weed preparations, any insect killing sprays, and general weed killers do keep your dog inside until everything has dried. Don’t forget to wear a face mask to protect yourself too. Lastly, if you must use slug pellets do make sure that these are placed away from anywhere that your dog might find them. Better still don’t use them at all. Our bird, hedgehog, toad and frog populations have suffered because of these. If it kills one thing the chain doesn&rst stop there. Spring is here, enjoy it; but most of all enjoy your Cavalier. Do dogs suffer from Alzheimer’s? This is a question that is often asked, and although the condition in dogs is not quite the same as that in humans, it does indeed have many parallels. Like people in western society, dogs are living much longer. This is no doubt due to better nutrition and great advances made in medical science. But greater longevity also yields higher instances of senile dementia. The condition in dogs is known as Canine Cognitive Dysfunction, or CCD, and just like Alzheimer’s in humans it is caused by physical changes in the brain and its chemicals. Autopsies have shown similar degenerative brain lesions in dogs that are found in humans with Alzheimer’s. With ageing, both humans and dogs can accumulate deposits of beta amyloid, a nerve damaging protein, in the brain. This protein can then build up into a plaque which inhibits the transmission of signals from the brain. With the build-up of this plaque the brain loses neurons that control thinking and memory. Amyloid plaque has so far only been noted in carnivorous mammals; it does not appear to affect herbivores such as horses or sheep. In advanced stages of Alzheimer’s the plaque will form into tangles. This does not appear to occur in CCD, so therefore Canine Dementia mirrors the early and intermediate stages of Alzheimer’s and not the advanced stage. It is believed that CCD is a result of damage caused to the brain by free radicals. Young dogs are able to produce free radical-neutralising antioxidants, however, with age, the ability to produce beneficial antioxidants decreases. Because older dogs aren’t as capable of producing antioxidants, the brain is more susceptible to the damaging effects of antioxidants. What then are the signs of CCD? These can be variable, and some of the signs could indeed be symptoms of other age-related ailments such as arthritis, deafness, and kidney or liver problems, so it is always important to first consult your vet. Some of the indications of dementia are confusion or disorientation – getting lost in familiar places or getting ‘trapped’ in a corner and not being able to find their way out. Loss of toilet training; soiling indoors or forgetting where the litter tray is. Change in social interaction and relationships; becoming more withdrawn, seeming depressed or forgetting members of the family or other pets. Loss of memory; not responding to familiar commands, forgetting previously learnt behaviours and difficulty in learning new tasks. Dogs have a built in biological clock and invariably know when it’s bedtime, time to get up and feed time. The inability to recognize these times, (i.e. barking in the middle of the night for no apparent reason), could be another sign of being disorientated. Other indications are sleeping more during the day but less at night, no longer recognizing family members, increased thirst and the lack of interest in food. As with the human form of dementia, there is no cure. Some people have found that B vitamin Choline supplement can improve the dog’s symptoms. A diet rich is omega-3 fatty acids are also believed to be of help. It is important to remember that CCD is not a life-threatening disease and with certain lifestyle changes, it is possible for your dog to continue living a long and happy life. Most importantly you should give your dog lots of comfort and attention. Pet them and talk to them. Go for short walks; provide a soft comfortable bed away from any drafts. Avoid moving furniture around as this can confuse the dog; familiar surroundings can aid the feelings of comfort and contentment. Allow them to take more frequent toilet breaks. Avoid clutter to allow the dog free access in and around the house. A dog suffering from senility needs a lot of social and physical contact, especially at night time – he may need stroking and comforting to calm his anxiety and to settle him to sleep. Your dog may forget where his water bowl is, so place more around the house. Lead your dog to his water after he has eaten and then to the garden to toilet. Be patient with them and give them lots of hugs and understanding and let them know that you are always there for them. In the December/January Cavaliers as Companions we mentioned "Cavalier King Charles Spaniel Handbook" which was soon to be published. 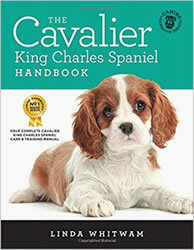 It is now available and this 266-page book is probably the most up-to-date and in-depth book on Cavaliers. It really is essential reading for anyone getting a Cavalier puppy, adult or rescue dog and is also a great reference for experience Cavalier owners and breeders. 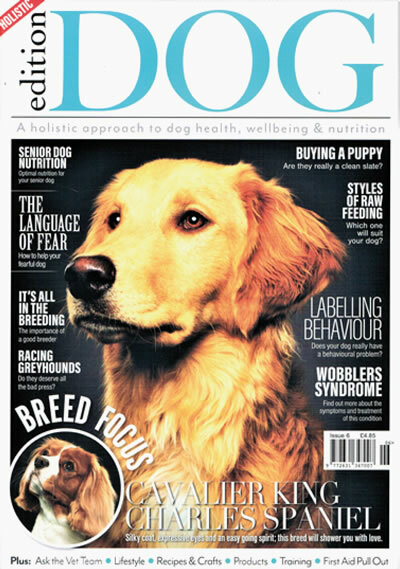 Canine author Linda Whitwam has teamed up with accredited experts to answer the dozens of questions every new & potential owner has. Together they provide a blueprint for a rewarding lifelong partnership between owner and their dog(s). The book is full of great illustrations and contains well written and extensive chapters on the history of the breed, the breed standard, acquiring and caring for a young puppy, feeding, Cavalier behaviour, exercise, training, health and allergies, grooming, breeding, showing, caring for senior Cavaliers and much, much more. It�s also available as an ebook for other eReaders and an Apple iBook, available from Apple Books. Is your dog happy? How do you know? What motivates your dog and how can you make sure you’re being a good human to your furry companion? Any dog owner likes to think their dog is happy but a recent study about dogs being hugged shows that many people interpret the signs incorrectly and don’t know how to recognise anxiety in their animal. 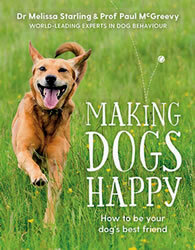 Making Dogs Happy is an illustrated handbook to getting to know your dog better for a happy and fulfilled household. Learn how to tell what motivates your individual dog and you can train your dog accordingly. Written by a veterinarian and a leading dog trainer, it introduces the idea of dogmanship – the ability to interact with and train dogs. Fully photographed, demonstrating key behaviours of dozens of furry charmers, it’s the one handbook no dog lover can go past. This book, which has only just been published, is not about Cavaliers, but it is indeed a story that any dog owner will love. 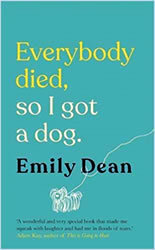 It’s a funny, heart-breaking, wonderfully told story of love, family and overwhelming loss which led Emily Dean to find hope and healing in the dog she always wanted. Growing up with her family was a fabulous training ground for many things: ignoring unpaid bills, being the most entertaining guest at dinner, deconstructing poetry. It was never home for the dog Emily craved. Emily shared the lively chaos with her beloved older sister Rachael, her rock. Over the years the sisters bond grew ever closer. As Rachael went on to have the cosy family and a treasured dog named Giggle, Emily threw herself into unsettled adventure – dog ownership remaining a distant dream. This is both a funny and also a heart-breaking, wonderfully told story of how Emily discovers that it is possible to overcome the worst that life can throw at you, that it’s never too late to make peace with your past, and that the right time is only ever now, as she finally starts again with her very own dog – the adorable Shih-tzu named Raymond. Another book that is not about a Cavalier but is indeed a true and deeply profound story that will appeal to any dog lover. Kate is a middle-aged woman trying to steer some order into a life that is going off the rails. When she adopts a lurcher called Wolfy, the shabby rescue dog saves her from herself. But when the dog disappears, it is up to Kate to hit the streets of London and find him. Will she save him, as he has saved her – or will she lose everything? As she trudges endlessly calling his name in the vain hope that she may find him, she runs into other people’s landscapes and lives, finding allies amongst psychics, bloggers and mysterious midnight joggers. 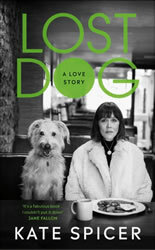 Trying to find her dog tests her relationship, and her sanity, to its limits – and gets her thinking about her life, and why things have turned out as they have for her. A brilliant, life-affirming memoir, Lost Dog is a book like no other about both about the myth of modern womanhood, and the enduring mystery of the relationship between human and canine. It is well documented how Charles II loved his spaniels, and that Queen Victoria had a Tricolour toy spaniel called Dash. However, Princess Anastasia of the Russian Romanov royal family also had a black and tan spaniel. 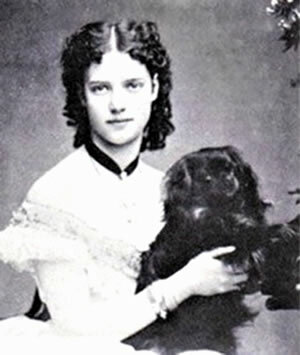 Above is a photograph of Anastasia with her beloved pet. The official story goes that she was murdered along with other members of the royal family by the Bolshevik secret police in July 1918. This would have been just one month after her seventeenth birthday, and judging from the age that she looks in this photograph I would have thought that this photo was taken not that long beforehand. Of course, the story of Anastasia must surely go down as the mother of all conspiracy theories. Countless books have been written and films made on how she apparently escaped and led a secret new life, and several different people have made claims to have been Anastasia. But I wonder what became of the dog? The Poet Carol Ann Duffy became Poet Laureate in May 2009 and will relinquish this post next month when her ten year post comes to an end. She used to own a Cavalier but is not the only eminent poet to have owned one. Elizabeth Barrett Browning also owned one, although they were not called Cavaliers back then, simply spaniels. She was born in 1806 and was educated at the home of her strict father, who was a merchant and a millionaire. She was a rather sickly child and her over-protective parents would never allow her to venture out alone. In fact, for a period of five years she never left the house and garden of her grand home in Wimpole Street, London. Elizabeth spent much of her time in her room and began to write poetry. 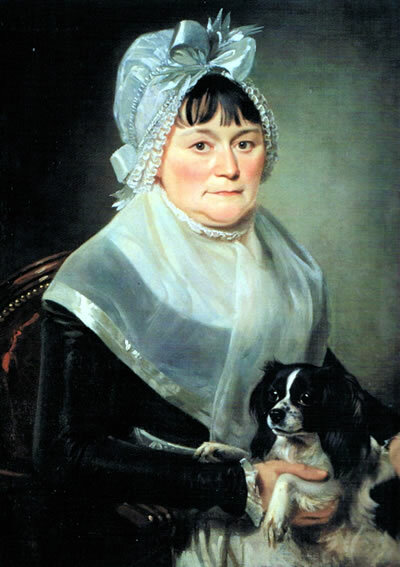 Her close companion was her pet spaniel Flush whom she absolutely adored. She admired the writings of the English poet Robert Browning to whom she started to correspond and they would send each other poems. Eventually they met and fell in love. When they decided to marry her father was furious and forbid the marriage but they did marry and then fled away to Italy. They both became very prominent poets, Robert Browning was most famed for his poem ‘Home Thoughts from Abroad’ which starts with the immortal lines "Oh to be in England now that April’s there". Elizabeth is widely renowned for the sonnet "How do I love thee? Let me count the ways." Many experts consider this to be one of the greatest love poems of the English language. 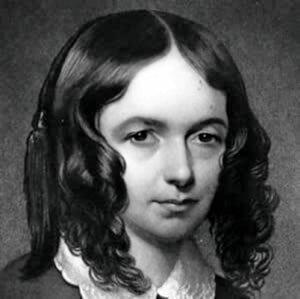 Flush was a gift from Mary Russell Mitford to Elizabeth Barrett Browning given at a time when she needed to be distracted from grief over her closest brother’s death by drowning in the summer of 1840. Flush accompanied the couple when they headed off to Italy after their marriage. Life in Italy for this beloved dog, as for everyone else, was far less cloistered than before – he even was allowed to be outside by himself, "whenever he likes, to run in the piazza (never farther) & enjoy the best society of the Florentine dogs." He died in Florence in June 1854 so he had quite a long life. 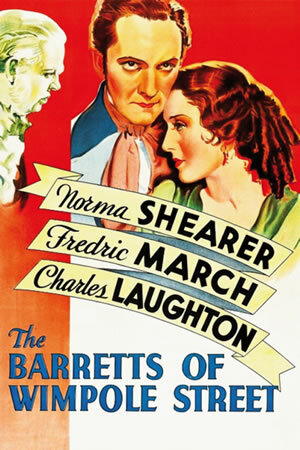 Their love story made the big screen in 1934 with an MGM film "The Barretts of Wimpole Street" starring Norma Shearer and Frederick March. A remake was made in 1957 with Jennifer Jones and Bill Travers. In both films her dog Flush was portrayed as a cocker spaniel. This was probably due to a book called "Flush" that was published in 1933 by Virginia Woolf. She greatly admired the work of these two poets and was fascinated by their love story. As a light-hearted break from some of her more demanding work this book, which was one of her more minor works, tells the story of their life through the eyes of the dog. However, she refers to Flush as a Cocker Spaniel. By all other documented accounts Flush is indeed described as a brown and white toy spaniel and is no doubt of the early Blenheim type. In several stage productions of recent years and also in a lavish BBC television version of the story, Flush is always played by a Blenheim Cavalier. The story was later transformed into a musical and opened in the West End in 1964 under the name of "Robert and Elizabeth". Elizabeth truly was a dog lover as can be seen by the words of her poem ‘To Flush, My Dog’. The words demonstrate the poet’s empathy with dogs. Flush provided great comfort to her when her sickness confined to the house for many years! We are sure that every dog lover will take enormous pleasure from the words of the poem. She also wrote another short poem to her beloved Flush. 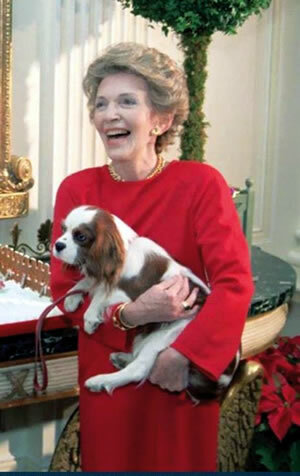 Nancy Davis Reagan was an American film actress who became First Lady and wife of President Ronald Reagan, the 40th President of the United States from 1981 to 1989. She is pictured here with her much loved pet Cavalier. The expression "Three Dog Night" originated in Australia and means a very cold night – so cold that you have to bed down with three dogs to keep warm. The phrase "Raining Cats and Dogs" originated in 17th Century England when many dogs and cats drowned during heavy downpours of rain and when rivers burst their banks. Their bodies would be seen floating in the rain torrents that raced through the streets giving the appearance that it had literally rained "cats and dogs". The term "Dog Days" dates back to Roman times, when it was believed that Sirius, the Dog Star, added its heat to that of the sun from July 3 to August 11 and created exceptionally high temperatures. The Romans called the period "Dies Caniculares" or "Days of the Dog". Two dogs survived the sinking of Titanic. At the end of the Beatles’ song "A Day in the Life" on the Sgt Pepper Album, an ultrasonic whistle, audible only to dogs, was recorded by Paul McCartney for the enjoyment of his Shetland sheepdog. When a dog bays at the moon, it is following its basic instinct to call the pack together. The only dog to ever appear in a Shakespearean play was Crab in "The Two Gentlemen of Verona." The Poodle’s "haircut" was originally devised to improve their swimming abilities. The pom-poms were left to keep their joints warm! Dogs take between 10 and 30 breaths every minute. A dog’s temperature is between 100.2 and 102.8 degrees Fahrenheit. Dogs do not sweat by salivating. They sweat through the pads of their feet. Female dog bites are twice as numerous as male dog bites. A dog’s sight is better than that of a human in dim light. Dogs have a visual range of 250 degrees compared to the human range of 180 degrees. A dog can hear sounds 250 yards away that most people cannot hear beyond 25 yards. The average dog’s mouth exerts 150 to 180 pounds of pressure per square inch. Some Dogs can apply up to 450 pounds. Why did the snowman call his dog Frost? Because frost bites! Why did the poor dog chase his own tail? He was trying to make both ends meet! What happened when the dog went to the flea circus? He stole the show! What happens when it rains cats and dogs? You can step in a poodle! If there is H2O on the inside of a fire hydrant, what is on the outside? K9P. "I much prefer giant teddy bears for comfort"
"Fall in love with a dog, and in many ways you enter a new orbit; a universe that features not just new colours but new rituals, new rules, a new way of experiencing attachment"
If you have any questions about owning a Cavalier then click on the envelope to email Dennis and Tina who will only be too pleased to try and help you. However please remember that we are not Vets or Lawyers so questions on these topics should be addressed to the professionals for advice. Questions and answers that are of interest to other owners may be published on this page. The Cavalier Club is not responsible for external website content.